Our hero, William Stoner grew up dirt-poor on a farm about 40 miles from Columbia, Missouri. In 1910, at the age of 19, he is sent off to the state University in Columbia to study agriculture. Two years into his studies, however, he discovers literature and decides to give up studying agriculture in favor of becoming a scholar. In due course he earns his Ph.D., stays on at his university as instructor, becomes an assistant professor, and teaches there for forty years until he retires and soon after dies. There are so many themes in this book worth exploring, it is hard to know which ones to focus on or even mention here. Perhaps the first one that becomes apparent is Stoner’s challenges in living in two worlds. His poor parents, with no education beyond the 6th grade, know nothing of his intention to study literature and not return to the farm until he finally confesses to them after his undergraduate commencement. And for about six years of his education he lives with distant relations remaining caught between his old and new lives as he earns his keep by working on their farm. He became conscious of himself in a way that he had not done before. Sometimes he looked at himself in a mirror, at the long face with its thatch of dry brown hair, and touched his sharp cheekbones; he saw the thin wrists that protruded inches out of his coat sleeves; and he wondered if he appeared as ludicrous to others as he did to himself. By the time he finishes his degrees and begins teaching he is fairly well-acclimated to his new world. The novel is not really about Stoner being a fish out of water. In fact his years of study are somewhat compressed in the overall arc of the narrative. The novel also deals with his troubled marriage. His wife waging a forty year war on her husband who she seems to hate, often using their daughter as a weapon against him. It is hard to know exactly what is going on with his wife, but she certainly seems bipolar to me. Many of the challenges in their relationship are exacerbated by their inability to communicate anything that is important. Imagine the paralysis of communication that takes place in Ian McEwan’s brilliant book On Chesil Beach and dial it back about forty years with all the associated differences in social and sexual mores and you start to get the idea. Equally engaging was Stoner’s life at the University and the political intrigue and fighting that seems to be unavoidable in the hierarchy of an academic department. It is true that I love a book with an academic setting, but I am not sure I have ever been pulled into that milieu in such an emotional way. There is one scene in the book where Stoner fairly and firmly confronts a student and a colleague during oral exams that had me so wound up that my heart was literally racing. And the fact that Stoner wins the battle but ultimately looses the war makes it even more heart wrenching. There is certainly joy in Stoner’s life, including a well-deserved love affair, but overall his life sometimes seems like more of a trial then anything. 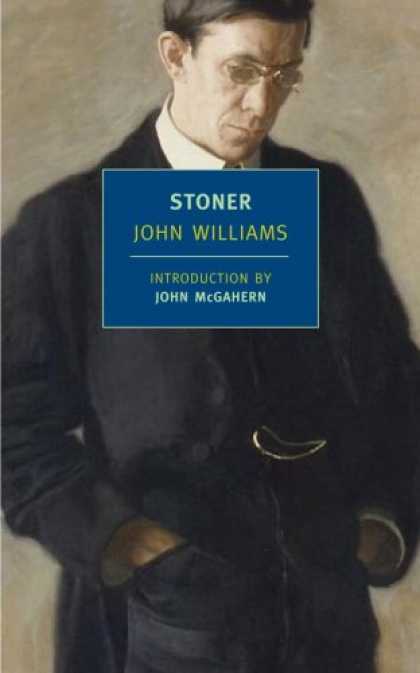 In an interview, author Williams, however, warns against taking this view of Stoner. It is hard for me to do justice to this book given my limited ability in literary criticism, but it really is a great book both in style and content and is definitely worth a read. This looks like an NYRB Classics publication. I love that publisher! Such excellent selections they make for book reissues. You did justice to the book, believe me, Thomas. That was a wonderful review. Thank you! Aarti: I am starting to agree with you. I had one miss which kind of had me biased, but now I have read three more that I really liked. Nan: Thanks Nan, I appreciate the kind words. I have been looking out for this to buy (I wanted the same NYRB edition, which isn't so easy to buy online here) since meeting you in person in November. Today I found it in the huge Waterstone's on Piccadilly. I shall report back. Wasv looking for à review and delighted I found yours.